Turn your PASSION into serious BUSINESS with Creativity for sale! Get your hands on "Creativity For Sale" eBook. Learn from one of the most innovative entrepreneurs, Jason SurfrApp and find out, how he turned a simple website into a $1M empire in just a few short years! This real life story will surely help you believe that, it's very much possible to pursue what you love without compromising on your earnings. Isn't $5.50 (DealClub $4) worth the chance that this book changes your life and business? It definitely is! Love what you do and do what you love. If you're passionate about your own projects, why not turn it into a full-fledged business? 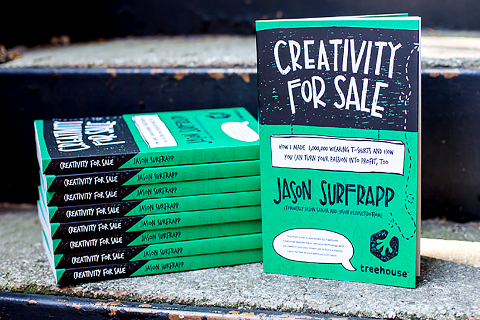 With this resourceful book by Jason SurfrApp, you'll learn how to turn your creative ideas into successes! You've heard the phrase, now live it! Using innovative, outside of the box thinking, you'll soon turn your creative ideas into a successful and profitable business! It doesn't matter what stage of life you're in, this book is perfect for you. Whether you currently have a 9-to-5 desk job, own your own business or are an aspiring entrepreneur looking to make it, this book will speak to you! In just a few years, Jason turned a germ of an idea into a social media marketing empire that generated more than $1M in revenue. With this book, he'll walk you through the steps you'll need to find your own success. It's a practical guide to making money by doing what you love. Learn Jason's tips, tricks and strategies that made him what he is today! It's a noisy world out there on the internet. But with Jason's advice, you'll find your way through the social media and online marketing crowds to stand out and get noticed! Jason SurfrApp is a truly non-traditional entrepreneur. He founded IWearYourShirt.com and auctioned off his last name to the highest bidders in 2012. Talk about thinking outside the box! Available as an instant download after your payment. Use 1 copy per user. Ready to grab "Creativity for sale"ebook just for $5.50 today?